…And did we ever! Vicki and I headed out early yesterday morning for Sew Expo in Puyallup. Mr. Squash took a photo of the happy quilters as we were leaving. Isn’t Vicki’s homemade quilted bag wonderful? I decided we might need something sturdy to carry our purchases, so I brought along my REI rolling backpack. We arrived safely at the Puyallup Fairgrounds and started off in the Pavilion complex. The first booth we hit was so much fun! Called Yesterday’s Charm, they had all sorts of vintage dishtowels and embroidery patterns and other great vintage stuff. They even had vintage dishtowel yardage! 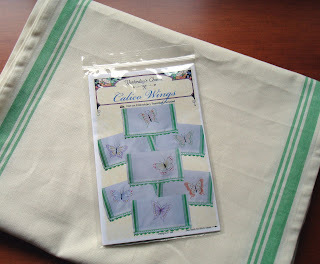 I couldn’t resist an iron-on transfer pattern of butterflies for towels at the Squash House kitchen. I got the pattern and 7 yards of toweling to make all the designs. I'm also going to look for some sort of vintage trim for the edges of the towels. The green stripe will look great with the new lights in the kitchen! The gals in this booth were hilarious and having a great time as were we! What a hoot! It was Katie Organ from The Paisley Pincushion (Terri - I was thinking of you!) who was sharing the booth! I asked her permission to take her photo for my blog and she graciously obliged! Thanks, Katie – what fun! Then we wandered down to the Bernina booth(s). I always love seeing the gals from my Bernina store there and of course accessories are always on sale at the show! I picked up the #11 Cordonnet foot for working with heaving threads – I recently saw a demo on machine Sashiko stitiching using this foot and want to give it a go! The we got to talking to one of the gals about the new Bernina 830. I had to take this picture of one of the backgrounds on the machine for Kim over at Kim’s Big Quilting Adventure! Kim is a big fan of cows! This gal also showed us how you can make a cow "moo" on the Bernina 730!! She said her eleven year old nephew figured it out! This is quite the machine – it’s enormous and filled with so many wonderful new capabilities! We also saw Libby Lehman helping a very young, adorable lady (so young she was sitting in Libby’s lap) do some free-motion quilting on the new 830! This little gal was doing a wonderful job - she's going to give Libby a run for her money someday! Tomorrow I’ll show you some more of my goodies from the Expo! How fun! Can't wait to hear more about your adventure! Sounds like you had a great time! I had no idea you could buy fabric for towels, LOL. You need the 830 Candace, to decorate the Squash House! Sounds like you had bunches of fun. I never knew you could get the toweling by the yard. I've never seen this before. I like this idea..ALOT! So, that rolling cart - how "full" was it? OH! Nice way of spending time!! Especially if you have a dear friend with you!! What a fun looking event. I really love that headband with the scissors too. So cute! I would love to have gone, maybe next year I will make it to Puyallup. Kaaren, pick up your hubby off the floor, I saw one yesterday at our local shop and it was ONLY, $10K, he should feel better now! Thanks Candice for sharing as always! Thanks for sharing. I have only been to one quilt show and that was Oct. I think I will have to get out more. ;0) And yes, Kim will love the cow!!! Oh what a fun time, especially sharing it with a friend! So glad you had so much fun. Scissors in Katie's head. Too funny and a little freaky.